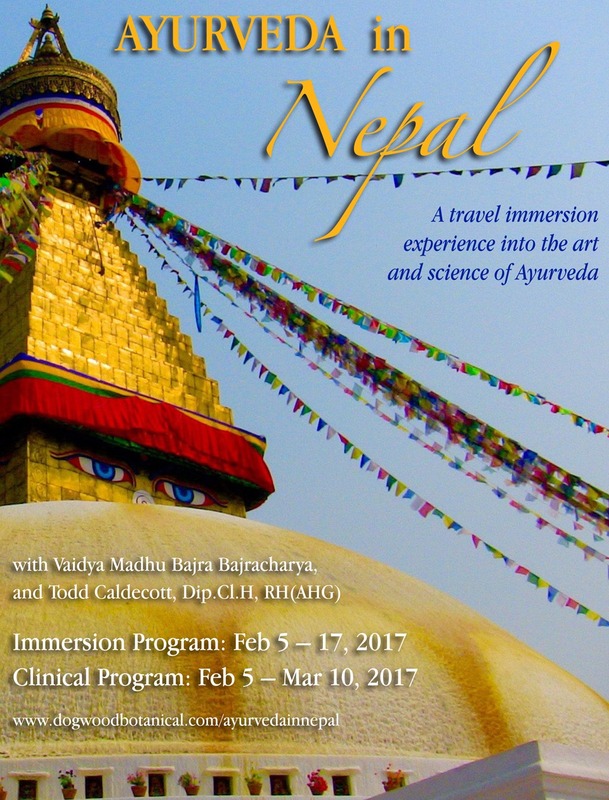 Join us on an amazing experiential adventure through the Kathmandu Valley in Nepal to partake in the fascinating art and science of Ayurveda. Thought by many to be the original birthplace of Ayurveda, the Himalayan region of Nepal is one of the richest countries in the world in terms of its biodiversity. Its unique geographical position and varied terrain provides ideal conditions for a vast array of herbs, flowers and aromatic plants, adding not only to the scenic beauty of Nepal, but to the materia medica of Ayurveda. Encompassed by the intoxicating view of the majestic Himalayas, you will wander through the Kathmandu Valley to admire the fascinating flora, coming face to face with many of the flowers, herbs and medicinal plants used in Ayurveda, connecting with their spiritual and healing energies. Through the guidance of your teachers, Todd Caldecott and Vaidya Madhu Bajra Bajracharya, as well as other local practitioners and physicians, you will learn, experience, and witness all that Ayurveda has to offer. Obtain a wealth of information through fascinating lectures, complemented by visits to local clinics, rural hospitals, and herbal pharmacies. Witness authentic Ayurvedic practices and treatments as well as the preparation of time-honored remedies used in Ayurveda. Study a variety of herbs and medicinal plants with experienced and knowledgeable practitioners, deepening your knowledge and appreciation for the ancient fount of wisdom that is Ayurveda. During this journey you will have the opportunity to spend some free time in Kathmandu, a city rich in art, culture and heritage. Wander through its maze of narrow lanes, immersing yourself in the bustling activity, gazing up at the inspiring temples and palaces. Enjoy visits to the UNESCO World Heritage site of Changu Narayan Temple, the oldest Hindu temple in the Kathmandu Valley, as well as many sacred sites such as Pashupatinath Temple, one of the most important places of pilgrimage for followers of Hinduism. Other important sites on the itinerary include Boudhanath Stupa, one of the holiest Buddhist sites in Nepal, and Swayambhunath, an ancient sacred Buddhist complex. And at end of the Immersion program, complete this once-in-a-lifetime experience in Nepal with a little pampering, enjoying a luxurious Ayurvedic Massage given by experienced therapists to relax, renew and rejuvenate. Students that have fulfilled the prerequisites may continue on after the Immersion program to participate in the Clinical program, which continues on day 16 (Feb 20). During these three weeks of intensive, all-day training, you will be immersed in the Bajracharya lineage of Ayurveda, introduced and trained in its time-honored methods and practices, enhancing your theoretical and practical understanding of Ayurveda. Optional weekend excursions include visiting local villages to provide outreach and support. 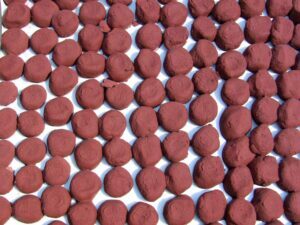 Classes will take place at Piyushabarshi Aushadhalaya clinic in Mahaboudha, and at the manufacturing facility in Arubari. Upon completion of this program, students will receive a signed certificate from the Dogwood School of Medicine that can be applied as credit towards completion of the Mentorship Program, and as a prerequisite to advanced training opportunities. 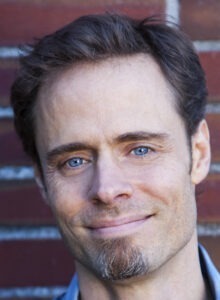 Todd Caldecott has been in practice as a clinical herbalist and practitioner of Ayurveda for over two decades. He has had a broad array of clinical experiences in diverse locations, including North America, SE Asia, and the Caribbean, working with a broad variety of conditions, such as autoimmune disease and metabolic disorders. His interest in natural healing began early in life and deepened through his extensive travels during his youth, visiting many interesting places and met many enlightening people. His studies have been diverse, including classical Indian (carnatic) music in Tamil Nadu and Buddhist meditation in Sri Lanka and Bodhygaya, India. In his search for spiritual and physical health, he has visited the famed ‘healthy’ Hunza peoples in the remote villages of the Karakorams in Northern Pakistan, and has had the great honour to spend time with a famed Sufi master in Shiraz, Iran. Todd has been a registered professional member of the American Herbalists Guild since 1997, and apart from his clinical work, also serves as Director at the Dogwood School of Botanical Medicine. He is author of the book Food As Medicine, and in 2014, was honored at Bastyr University as the 2014 Visiting Mitchell Scholar. For Vaidya Madhu, the practice of Ayurveda is deeply rooted in his Bajracharya lineage, passed down from generation to generation over the last 800 years. Vaidya Madhu Bajra Bajracharya learned Ayurveda from his father, the late Vaidya Mana Bajra Bajracharya, an internationally renown Ayurvedic physician, healer, teacher and Buddhist Priest in Nepal, who practiced Ayurveda for over 40 years. Born in 1955, Vaidya Madhu also holds a BSc in Zoology, and has been in clinical practice since 1976. Vaidya Madhu has traveled the world extensively, lecturing on Ayurveda in Europe, SE Asia and North America, training medical doctors and providing his clinical expertise in the fields of Immunity, Cancer, and indigenous Newari medical knowledge. He is Chairman of the Association of Nepal Traditional Ayurvedic Medical Practitioners, and is a proud representative of Newari culture, serving as Vice Chairman of “Hapa Guthi”, an association of local Newari Culture. Vaidya Madhu also serves as a consultant for the Himalayan Herbal Preparation Pvt Ltd, a joint Nepali-Italian venture, and provides his clinical services at his family’s ancestral clinic in Kathmandu, Piyushavarshi Aushadhalaya, the oldest Ayurvedic clinic in Nepal. Arrive in Kathmandu, once thought to be the fabled Shangri-La. If you have arranged a package deal, you will be met upon arrival at the airport, and transferred to your hotel for check in. Enjoy the morning at your leisure to take in the sights and sounds of the city and familiarize yourself with Kathmandu. This fascinatig city is rich in legends and artistic and cultural heritage. Follow the labyrinthine narrow lanes which lead to a multitude of small squares. Check out the Durbar Square crowded with temples and palaces and immerse yourself in the bustling activity. In the afternoon we make our way to Piyushabarshi Aushadhalaya to enjoy our first lecture with Vaidya Madhu – Introduction to Nepalese Ayurveda and the Bajracharya Tradition. Vaidya Madhu will give us an introduction to Newar Buddhism, the Bajracharya consecration, and insight into his own family traditions. 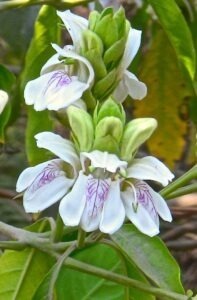 He will also explain the definition of Ayurveda, its historical background and the 8 limbs (ashtanga) of Ayurveda. We later gather in the evening to enjoy our Welcome Dinner to learn more about each other and share our intentions for the journey. Enjoy the morning at your leisure independently. In the afternoon we make our way to Piyushabarshi Aushadhalaya once again to enjoy our second lecture with Vaidya Madhu – Tridosha Siddhanta. During this lecture Vaidya Madhu will explain the different aspects of the three active dohsas: Vata, Pitta and Kapha. In the philosophy of Ayurveda, the five elements combine to form three dynamic forces called doshas, or “bodily humors”. According to the theory of Ayurveda, the doshas are the governing principles of the body, and when in a state of balance they facilitate good health, whereas when their equilibrium is disturbed, the doshas act to cause disease. Another day of fascinating sightseeing! We begin the day with a guided tour of Pashupatinath Temple which lies in one of the most important places of pilgrimage for followers of Hinduism. Pashupatinath is known as the guardian spirit and the temple is thus, considered the holiest of all Shiva shrines in Nepal. On both sides of the temple doors there are artistic niches of different sizes containing beautiful images of Apsara, Ashtha Bhairava and other gods and goddesses. 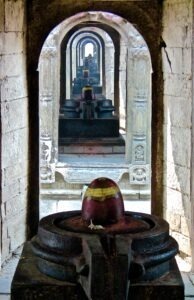 In the sanctum of the temple, lies Shivalinga with its four faces, each having a different name and significance. These faces are also defined as the symbol of the four dharmas, the most famous places of pilgrimage for Hindus, and the four Vedas, sacred books of Hindus. The images of Vishnu, Surya, Devi and Ganesh are also placed in the sanctum of the temple. Sitting along the shores of the Bagmati River, the temple is surrounded by a large bustling market with many vendors, giving us an excellent opportunity to pick up gifts and souvenirs. 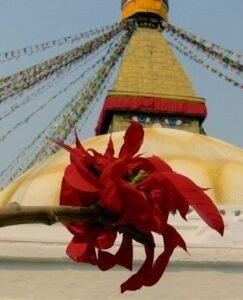 We then visit Boudhanath, one of the holiest Buddhist sites in Nepal. The city is home to the ancient Buddhist Stupa which dominates the skyline and is one of the largest in the world. The Stupa’s massive mandala also makes it one of the largest spherical stupas in Nepal. According to legend, Boudhanath Stupa was built by an old poultry woman who asked the king for land to construct a shrine to the Buddha. The king agreed, and offered her as much land as she could cover with the skin of a water buffalo. The woman proceeded to cut a buffalo hide into thin strips, and placed them end to end to form a huge circumference. The king realized that he had been tricked by the old woman, but he adhered to his word, and the Stupa was constructed according to these dimensions. Nowadays, the Stupa is the most popular site for Tibetan Buddhists in Nepal, and throughout the day pilgrims can be seen circling the structure while chanting mantras. At night the Stupa is adorned with brilliant butter lamps creating a dramatic light display. Finally we end the day with Swayambhunath, an ancient religious complex atop a hill in the Kathmandu Valley. 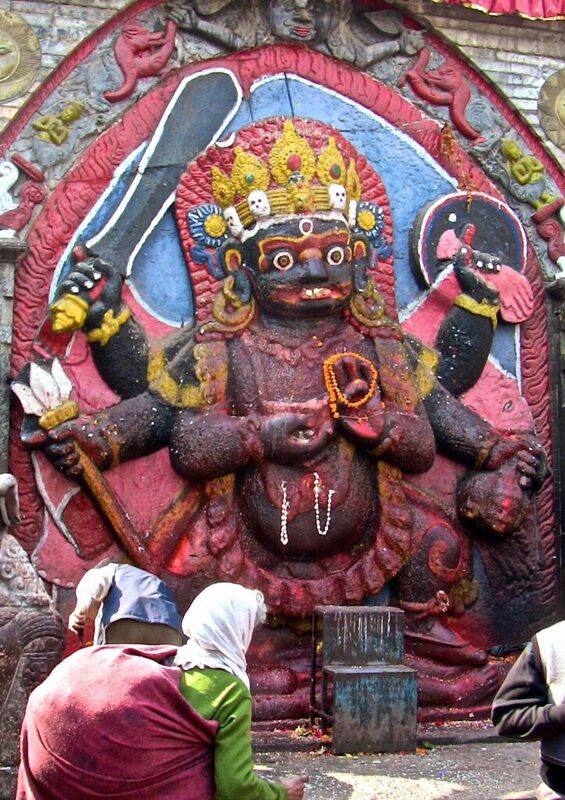 Considered one of the holiest Buddhist sites in Nepal, it is of prime importance to the Newari Bajracharya lineage. According to Swayambhu Purana, the entire valley was once filled with an enormous lake, out of which grew a lotus. The valley thus came to be known as Swayambhu, meaning “Self-Created”. The water was drained out of the lake, leaving the valley in which Kathmandu now lies and the lotus was transformed into a hill which became the Swayambhunath Stupa. 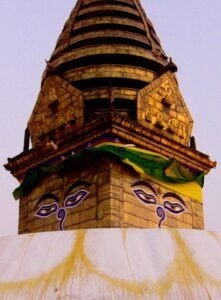 The Swayambhunath complex consists of the Stupa, a variety of shrines and temples, a museum, library and also has a face of the Buddha painted on it with Buddha’s eyes and eyebrows. The eyes represent the awakening or enlightenment as each person achieves wisdom and compassion. What is believed by some to be a nose is actually the Nepali symbol of unity in the main Nepali language dialect. The dome at the base of the Stupa represents the world, and the thirteen pinnacles on the top symbolize the thirteen stages one must pass to reach enlightenment. After a morning of leisure, in the afternoon we make our way to Piyushabarshi Aushadhalaya once again to enjoy our third lecture with Vaidya Madhu – Daily Living in Ayurveda. Today Vaidya Madhu will discuss “swasthya vignana”, the daily practices of Ayurveda, as well as “ahara vignana”, dietetics in Ayurveda. Today we begin the day with a guided tour of Bhaktapur, an ancient Newar town in the Kathmandu Valley. This beautiful city features classical Newari architecture, much of it still surviving since the earthquake in 2015, known as the “City of Devotees”, the “City of Culture”, and “Nepal’s Cultural Gem”. It is one of the 3 royal cities in the Kathmandu Valley and is renowned for its elegant art, interesting culture, colourful festivals, traditional dances, as well as some tasty treats such as “Juju Dhau”, a “royal yogurt” made from buffalo milk. Bhaktapur is dotted with pagodas and religious shrines and is filled with terra cotta monuments, carved wood columns, and palaces and temples with elaborate carvings, gilded roofs, and open courtyards. Lying along the ancient trade route between India and Tibet, Bhaktapur is surrounded by mountains and provides a magnificent view of the Himalayas. Later we visit Changu Narayan Temple, the oldest Hindu temple in the Kathmandu Valley, designated a UNESCO World Heritage Site. The temple is named after Vishnu, the deity for which it enshrines, and is adorned by some of the finest specimens of stone, wood, and metal craft in the valley. The temple is of great importance due to its shrines which are rich in architectural beauty, as well as its idols such as, the Vishnu idol which has ten heads and ten arms and is an excellent example of 5th century stone carvings. Take the weekend off and enjoy the many sites, smells and sounds that Kathmandu has to offer. Visit the King’s Palace to view the giant fruit bats hanging from the trees, or wander the Thamel district of Kathmandu, which is haven for tourists, containing numerous restaurants and shops that cater specifically to western appetites. Optional excursions and interesting day-trips will also be available. After a morning of leisure, in the afternoon we make our way to Piyushabarshi Aushadhalaya to enjoy our fourth lecture with Vaidya Madhu on Rasayana Tantra, the branch of Ayurveda that deals with anti-aging therapies to maintain youthfulness, increase longevity, enhance strength, and prevent disease. During this lecture Vaidya Madhu will also introduce the practices of Rasa Shastra, a system of alchemical practices used by Ayurveda, and mastered by the Bajracharya lineage, that relies upon the usage of specially purified substances as a medicine. Revel in a day of discovery with our full day excursion to the visit traditional herbal pharmacies in Banepa and Arubari. Today we will learn about a variety of medicinal herbal and aromatic plants and the way they are used in Ayurveda to help cure and prevent diseases, and promote good health. Later in the day we enjoy a lecture with Vaidya Madhu on The Preparation of Ayurvedic Remedies, where we will learn about the different combinations of plants and herbs used to create medicinal remedies. Today we will visit the Devi Ma Kunja Rural Ayurveda Hospital in Sipadole Village, founded by Dr. Sarita Shreshta. Dr. Shreshta is a classically trained Ayurvedic physician with more than 25 years of clinical experience, renown as Nepal’s first Ayurvedic OB/GYN. During this lecture, Dr. Shreshta will share her knowledge and experience of Ayurveda, with a focus on the science of prasuti-tantra (obstetrics) and stri-roga (gynecology), and the unique Newari traditions used to support mother and child. Today we enjoy a full day trek and herb walk through the scenic Kathmandu Valley for an introduction to some of the important plants used in Ayurveda. As we hike through the stunning natural environment, your teachers will describe the various herbs and medicinal plants used in Ayurveda. We will have an opportunity to ask questions regarding the flora we encounter and learn about the importance the natural environment has on Ayurveda and our health. Your teachers will also discuss the principles of “dravyaguna” or pharmacology, along with the taste qualities, energy, effect and special properties of medicinal plants and herbs. This will be an exhilarating day to reconnect with Mother Nature and form a deeper respect and appreciation for our great Earth. Relish a day of pampering and luxury! Today we travel to Maharajgunj to enjoy an authentic Ayurvedic Massage. Take the time to relax, renew and rejuvenate as you are drenched in herbal infused oils, and massaged by expert therapists. In the evening we gather one last time for our Farewell Dinner. As we celebrate our time in Nepal we will have the opportunity to review and share all we have learned and experienced with our new found friends and ask any remaining questions we may have. NOTE: This itinerary subject to change due to conditions beyond our control. All other costs, including air travel, medical/travel insurance, personal expenses, etc., will be borne by the participant. To register for the Immersion Program, please contact our partner at Sacred Earth Journeys, who is happy and ready to meet your needs. Students that wish to participate in the clinical program must be enrolled in the Inside Ayurveda program, or have completed an introductory program in Ayurveda equal to or greater than 90 hours. Applications will be reviewed on a case by case basis to ensure the highest quality of participation. Please note that this price for the Clinical Program only includes costs related to the delivery of the program, including transportation for educational excursions, as well as the welcome and farewell dinners. All other costs, including medical/travel insurance, airfare, accommodation, food, taxes, fees, etc., will be borne by the participant. If you require assistance with these details, please contact Bipin at Social Tours in Nepal, to set up your itinerary. There are limited number of spots available in both programs.